The celebration is a reenactment of Mary’s and Joseph’s search for lodging in Bethlehem. In the classic Las Posadas, a group of “pilgrims” from a church goes out into the neighborhood, accompanied by a costumed Mary and Joseph (or carrying Mary and Joseph images). They stop at pre-arranged houses and sing a song asking for shelter. At each place, they are turned away. Thus they symbolically share in an experience most of us have had: the experience of rejection. Finally, they come to the last stop – usually the church. There they sing once more, and the “Innkeeper” opens the door and invites them to stay. All the pilgrims come inside to hear the Christmas story read aloud, to sing carols and have a party. For the participants, they experience first the pain of rejection and then the grace of welcome. They celebrate the birth of Christ in a warm and welcoming, community-oriented way. They understand that God’s door is always open to them. Because the celebration involves going out into the community, it is an opportunity for evangelism, as neighbors are invited to join the “pilgrims” and follow them to the church, where they meet church members, hear the Christmas story, and enjoy a party. You can download a free booklet called "How to Celebrate a Mexican Posada", prepared by Hugo Olaiz of the Diocese of North Carolina, Here. This article came from TENS - The Episcopal Network for Stewardship. 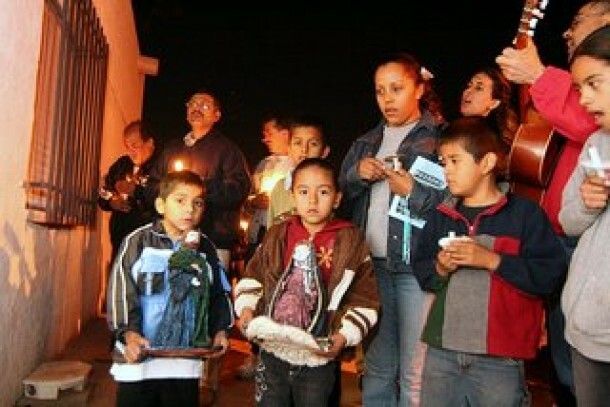 More links about Las Posadas can be found on their site.